Everyone likes to root for the underdog, and when it comes to the underdog in the circles of mainstream e-readers, there's little doubt that Kobo fills this role. The upstart Canadian company, owned largely by Canada's Chapters Indigo bookstores, released its first e-reader in 2010, launched an online e-bookstore, and took on Borders as a partner. That first generation hardware was okay but hardly earth-shattering, and we all know how things have gone with Borders. Despite these setbacks, Kobo has kept chugging along. Now, the Kobo eReader Touch Edition provides the company with a very competitive e-reader. If you think that the Kobo eReader Touch Edition looks more than a bit like the Barnes & Noble NOOK Simple Touch, you aren't the only one. Both devices were released in the same timeframe, both go for a minimalist touch interface, and both are extremely compact 6-inch display devices. When you see them together, though, you'll realize that the Kobo is the more compact of the two; it adopts a more traditional form factor which makes it narrower and slightly thinner than the NOOK. It's also lighter and definitely more pocketable. 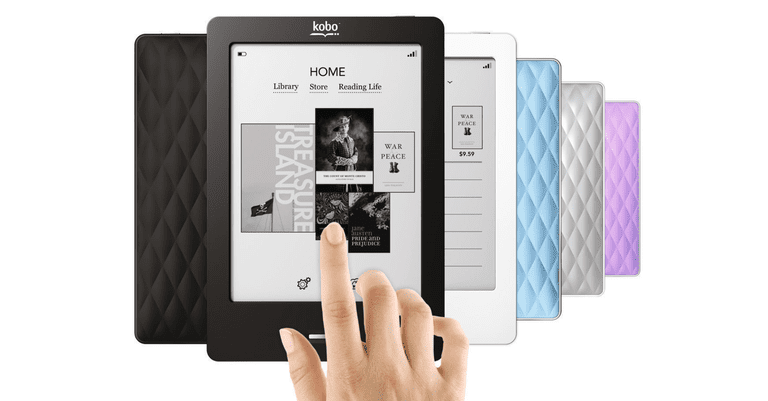 The new Kobo also carries over a distinguishing feature from the first generation models: the distinctive quilted back, available in four different colors (lilac, blue, silver, and black). While the eReader Touch is more comfortable to hold in one hand than the NOOK Simple Touch, the back is more slippery and lacks finger holds, making the eReader Touch more suited to two-handed use. The Kobo employs a user interface that's both intuitive and attractive. Navigation is painless and settings are quite easy to access, with sliders used to adjust font sizes, line spacing, and margins. It takes little time to get the hang of moving around, downloading e-books and choosing from titles in your library. Battery Life: Up to one month (with WiFi turned off). The Kobo eReader Touch employs a faster processor and technology that reduces that black flash you see when E Ink e-readers change pages. The result is much speedier page turns than the previous model, with the display fully refreshing only once every six page turns or so. The responsiveness of the display was on par with other devices using an IR touchscreen system. Every once in a while, a finger is just off the mark resulting in an unintended action, usually a menu being displayed. If you're not big on touchscreen interfaces, you're out of luck since there are no physical buttons available for page turns, just power and home buttons. One of its firmware updates gives the eReader Touch a unique ability: the capability for users to upload their own fonts to the device, eliminating the limit of single-digit built-in fonts available on most e-readers. Although it's relatively stripped down in order to offer an inexpensive e-reading experience, there are a few extras available, including an experimental web browser and a sketching program (think Etch-A-Sketch). Both are rudimentary and subject to the display refresh issues inherent with E Ink, but in a pinch, they might be useful. Battery life is claimed to be one month (with WiFi off). This display-refreshing technology is a very distracting design flaw. On the initial page refresh, everything looks great with the crisp text and contrast, but on subsequent page turns, ghosting begins to appear on the display, becoming progressively darker until it fully refreshes again. It's not sufficiently dark to prevent reading, but it's annoying. There is an advanced setting available through a subsequent firmware update that allows you to change the number of pages before a refresh (from 1 to 6); refreshing every page appears to resolve the issue but at the cost of reintroducing that black flash every page. The black flash seems more prominent in this case than with other e-readers. You do have six possible configurations to experiment with, and hopefully one will strike an acceptable balance. In higher temperatures (85 F and up), the Kobo's display exhibited streaking and smearing that would eventually make the text difficult to read in spots. Similar to above, on a refresh, it was perfect, but every page tour until the next refresh became progressively worse. For whatever reason, Kobo has decided that before you are able to buy books online using the built-in WiFi, you first have to physically connect to a computer to register the device. This seems completely unnecessary, adding complication and inconvenience. If you pick up a WiFi-equipped Kindle or NOOK, all you need is a corresponding e-bookstore account and away you go. With the Kobo, you have to download the appropriate Kobo desktop application, launch it, and either sign in to your existing Kobo account or create a new one to register the device, after which any new e-reader firmware is automatically installed. In my case, the update process took roughly 20 seconds. You can skip this step, but the e-reader warns you pretty firmly that doing so isn't a great idea, pointing out that you won't be able to connect to the Kobo e-bookstore or synchronize your e-books. Once you've completed registration, you're then free to function fully with WiFi. Recharging of the device is accomplished via USB connection to a computer. That's nothing new, although more e-readers are beginning to include a USB recharger in the box. The Kobo eReader Touch strikes a decent balance between features and price. Its compact size is a definite plus and the user interface is pleasant to use. It supports a wide range of files and the Kobo e-bookstore, while not quite on the scale of Amazon, offers a pretty decent selection of e-books. Having the ability to choose from a selection of case colors is a nice option as well. The ghosting on the display and warm weather performance are clear issues; while neither renders the device unusable, the artifacts and ghosting definitely detract from the user experience, especially when compared to other current generation displays. If you're unsure about whether this might be an issue for you, try one out in-store, and if you're not bothered by it, then you'll likely be quite happy with this e-reader. The requirement to physically connect to a computer before shopping via built-in WiFi is an odd choice that potentially alienates a whole subset of customers who want to buy books online but lacks a computer. As much as we like many aspects of the Kobo, we'd choose the NOOK Simple Touch.